Wells is the one of the smallest Cathedral cities in England and is near to the village of Cheddar (previous post). It is ideal for timing to combine both places and visit them on the same day. 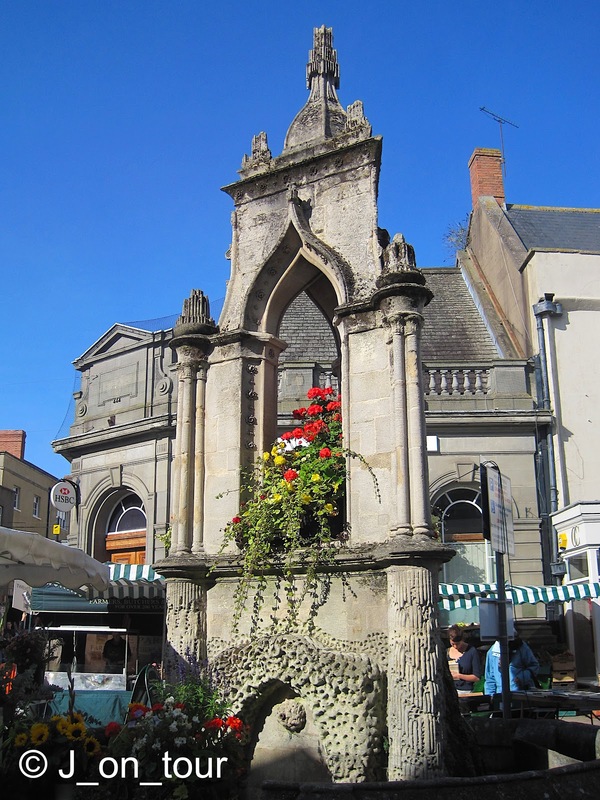 The name Wells originates from three wells in the historic centre dedicated to the memory of St Andrew. The example above is the one found in the market place. 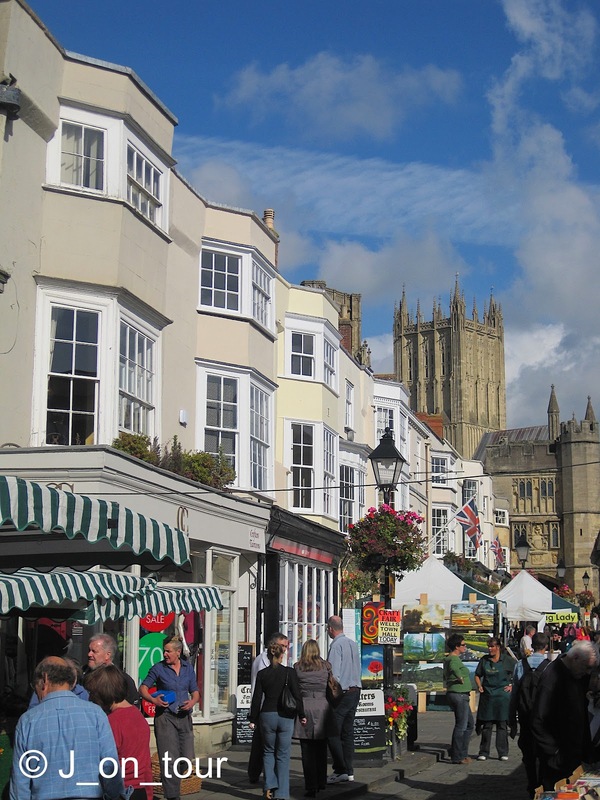 Although of minor importance in Roman times, Wells became prominent in Saxon times when the King of Wessex organised the building of a church around 700 AD. In the Middle Ages, it became a cloth making centre which decreased in importance although the market tradition carried on to this day. It is unfortunate that in the city of the "three wells" that I only have a photographic record of one of them, so as an alternative.... I bring you the city of three doorways !! 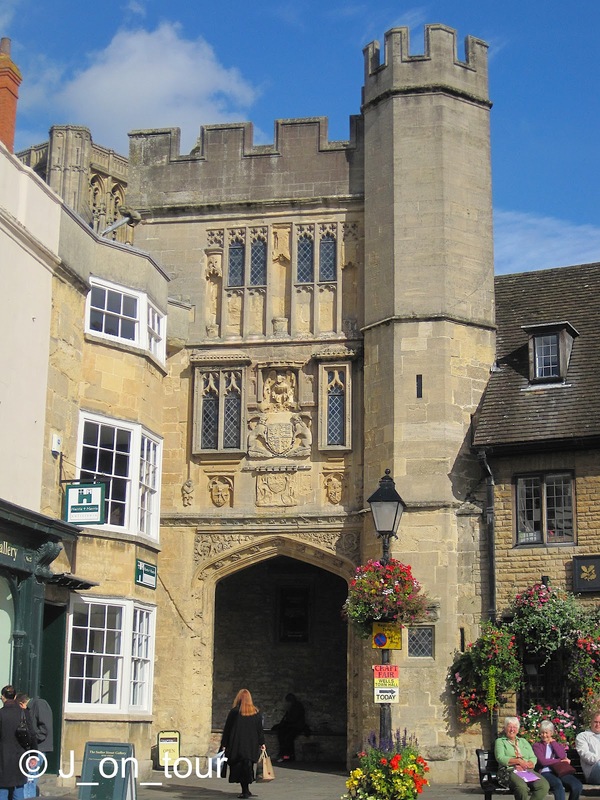 Although there is evidence to suggest that parts of the cathedral date back to the 10th century, it is accepted that most of it is built in the 12th century with surrounding walls, buildings and entrances (Bishop's Eye and Penniless Porch) completing the enclosed area during the mid 15th century. Vicar's close, adjacent to the Cathedral, claims to be the oldest (late 14th century) residential street in Europe. Canon Walter de Hulle gave land for the building of homes for 13 priests. Architecturally, it is pure genius as the street is built in a tapered fashion with the width being 3 metres narrower at the top providing the optical illusion of a longer street. 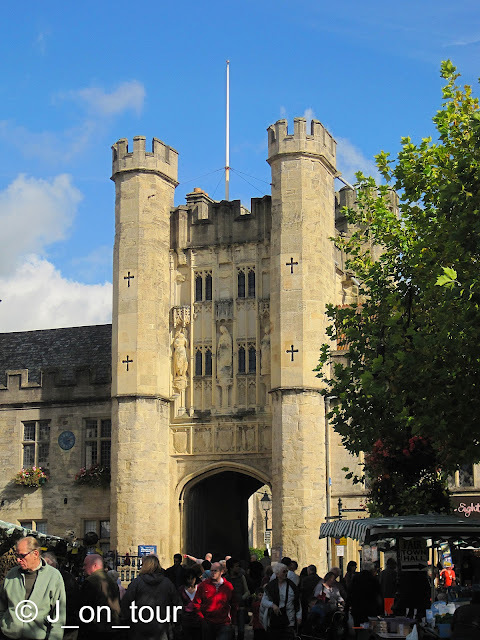 On the opposite side of the Cathedral stands The Bishop's Palace which has been their home since the early 13th century. 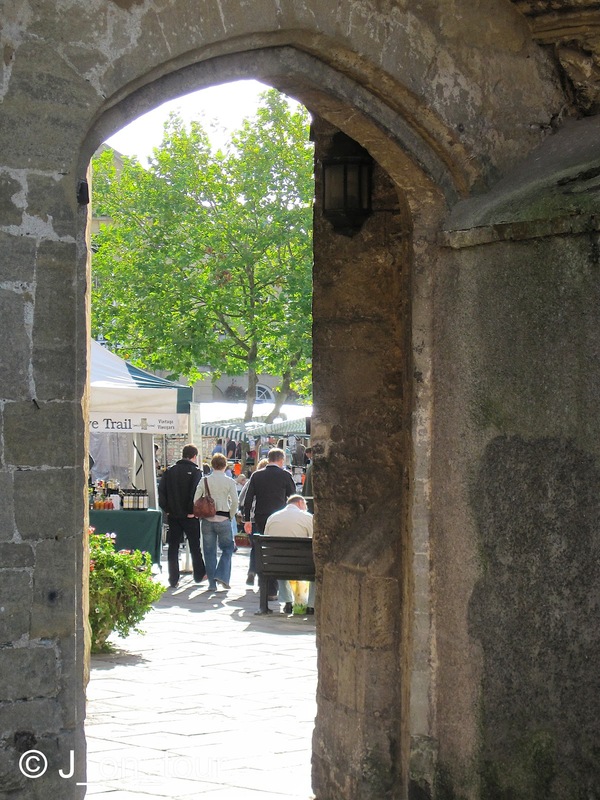 ... while the entrance from the market place into the Palace was built during the 15th century. 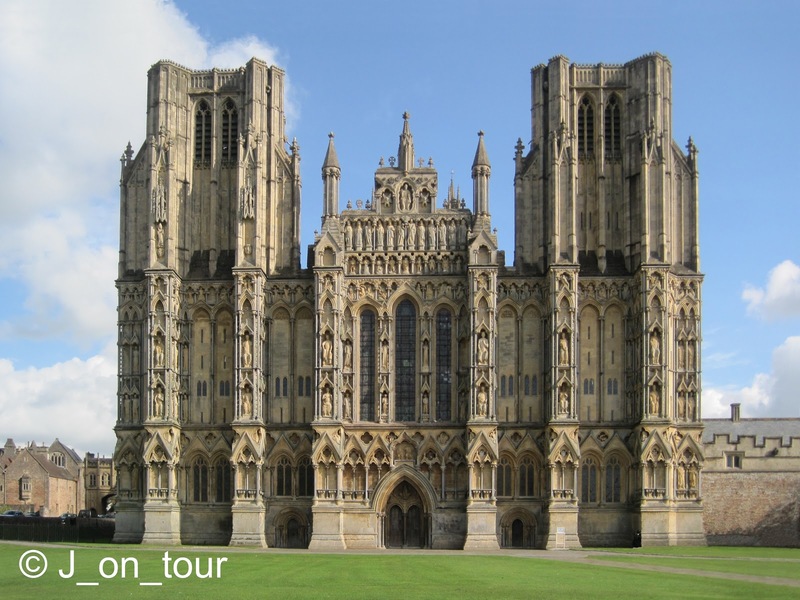 I love this post of Wells Cathedral! And I laughed when I saw the doorway shots, for I've always really liked various types of doors. I have a whole folder of 'Doors of Richmond.' 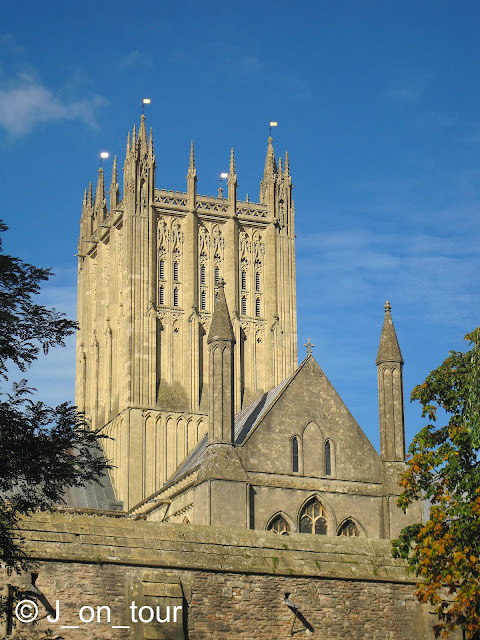 :-) I didn't have a decent camera when we were at Wells, unfortunately, but we mostly went there to visit the Cathedral, and were going to stay for Evensong except that it was getting darkish and we had yet to travel to Cirencester. You know how windy and narrow the roads in that area are, especially to an American, so we left early so as to get to our B&B before dark (still didn't make it). Johnny Depp was filming something at the Cathedral so we didn't get to see all of it, (which annoyed me that we were snubbed for a movie star)LOL but I remember the clock especially and scissor arches. 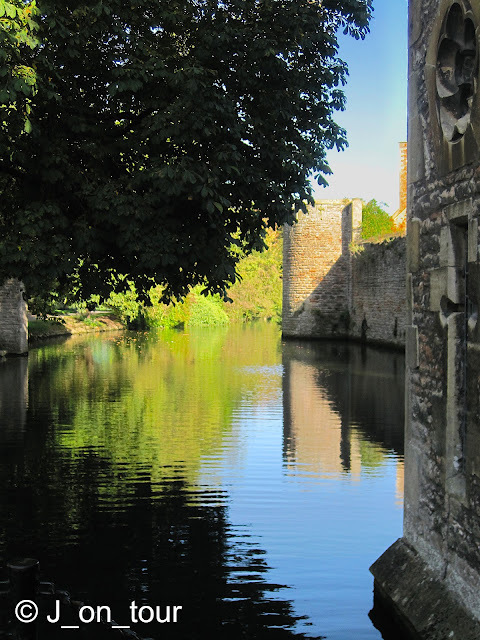 Also especially love your shots of the water and also The Vicar's Close. They're beautiful! I read somewhere that when the Cathedral was built the west front was painted and very colorful. Do you remember hearing anything about that? 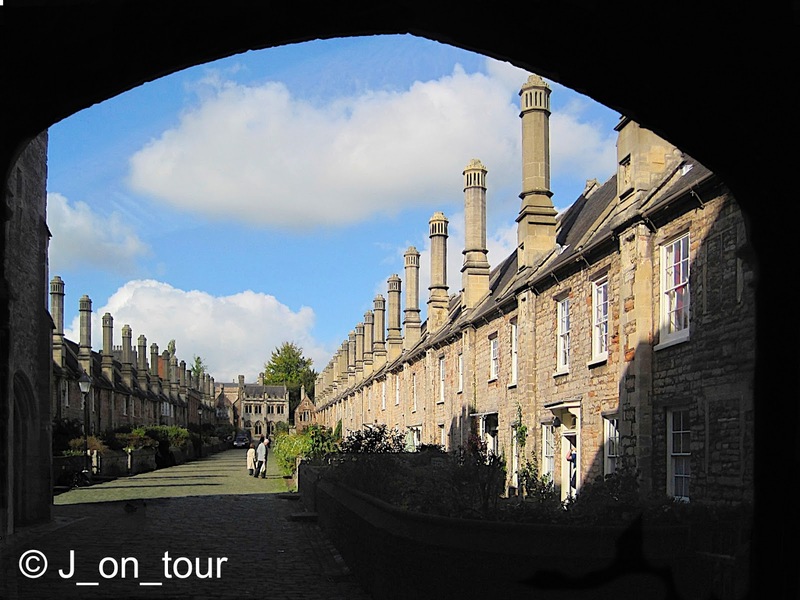 Splendid your first two photos, J_on_tour but I also like the line of chimneys...Weldone! 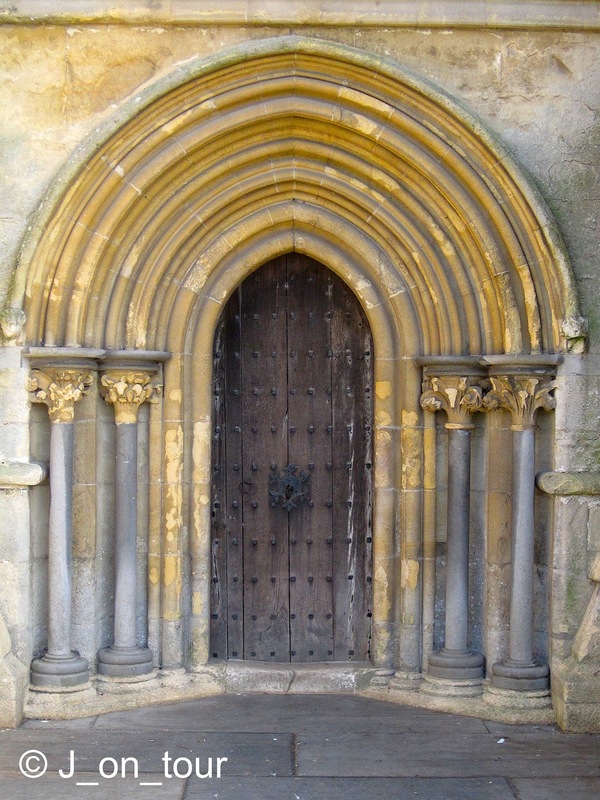 I like your pictures of the doorways. That's an interesting fact about the street being 3 meters narrower at the top. 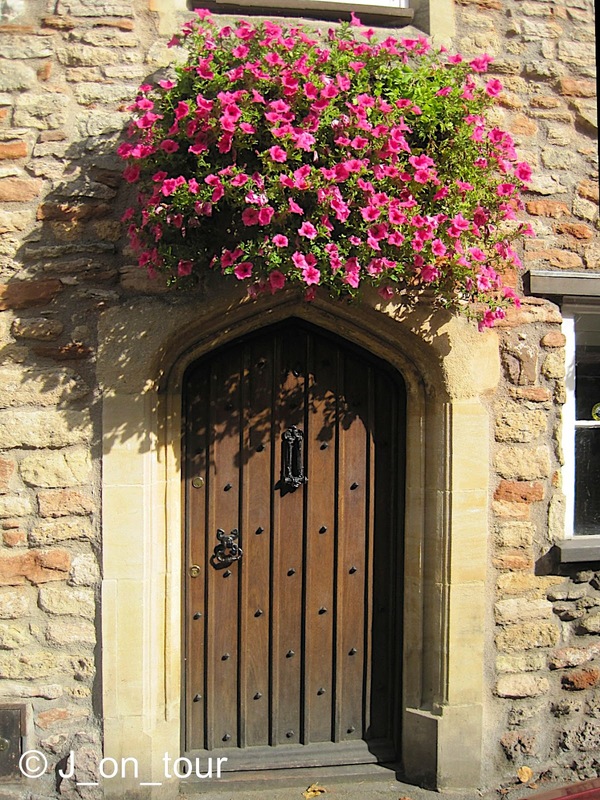 Love the doorways. If I ever go to the UK I'm going to study your blog first, and make a list of places to go. I just can't come look at your blog anymore.... envy is not a good feeling. Beautiful scenery & architecture! I'm jealous of your photography! Wonderful place. Stunning. The opening image is just as I remember it.........can you straighten it if not e-mail me...that's if you think it requires it......delete this if you want. The alms houses are superb. One of my favorite cathedrals - a grand place Wells..! The first picture in this post, that of the cathedral is breathtaking! And the names...I like the names: "penniless porch", "the bishop's eye", 'the three wells", "vicar's close". There's always something in names that draws my attention. 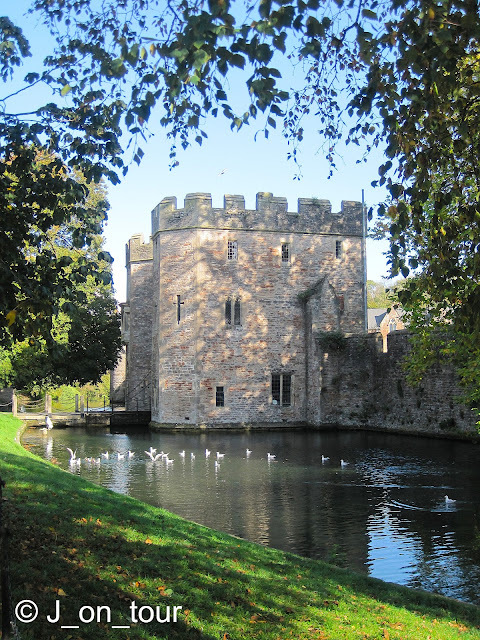 As soon as I am not a 'shop till you drop' woman , but a Princess (ha ha) I am in love with this colorful post, with those doors with flowers...battlements...the Gatehouse and the lake with birds and THE GRASS! 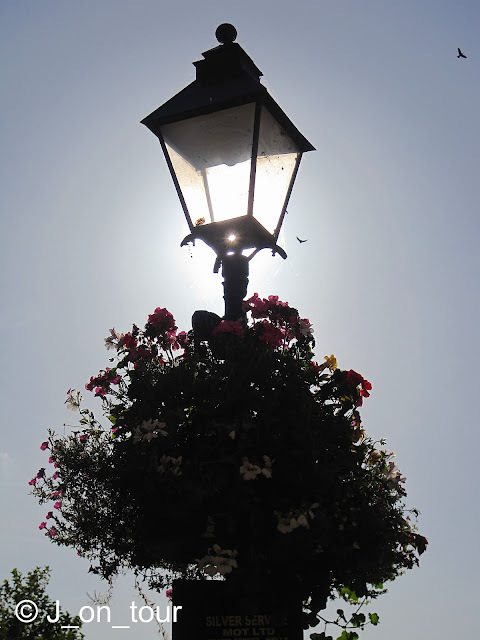 I was amazed about 'Market place lamp', J! In the first moment I thought that it is my photo....ha ha. I took one, almost the same, in Greece - last summer...in Metzovo! So small world, yet so big! Something with a lot of grass , please! You impress me much dear J ! Your travels are always pleasant and photos prove it ! It's always nice to lay on your page ! 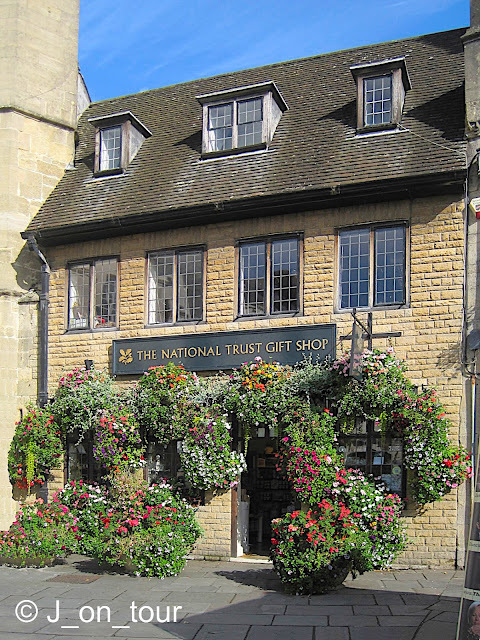 Its a beautiful place, I love The Vicar's Close. Plus its goes without saying your photos. Thanks for your vist and comment. I'm am putting together a post of a walk around Jackfield that we did on Saturday. I have started following Cranberry Morning. When I came to your blog she had done a post on Ironbridge Shropshire, that court my eye on your side bar, and since a post on Jackfield! which she is letting me link back to, but because I found her from your blog I would like also to put a link on to you. Jan @ George the Lad... No problem, thanks for your comment, it was interesting to read both of your Ironbridge posts and I thought of you when I was reading Cranberry Morning's post. it was also bizarre that I saw the Michael Portillo railway programme from there on BBC iplayer in the same week.... so even though I've never ever been but skirted all around the place, I am well educated now from three sources ! Replies to the other contributors later. Cranberry Morning... Thanks, With hindsight, I wish I had more time here on this occasion (2-3 hours car parking). I was with another person looking around the market who thought I was going to just photograph the West Front but I rushed to get images 1, 5, 7, 9, 10 & 16. Looking at them now, I would have given them better treatment. I had heard about the West Front being painted in the Middle ages. The Cathedral website said it looked like a giant picture book. I think I have only been inside once in recent times... The clock is amazing. Traveling Hawk... 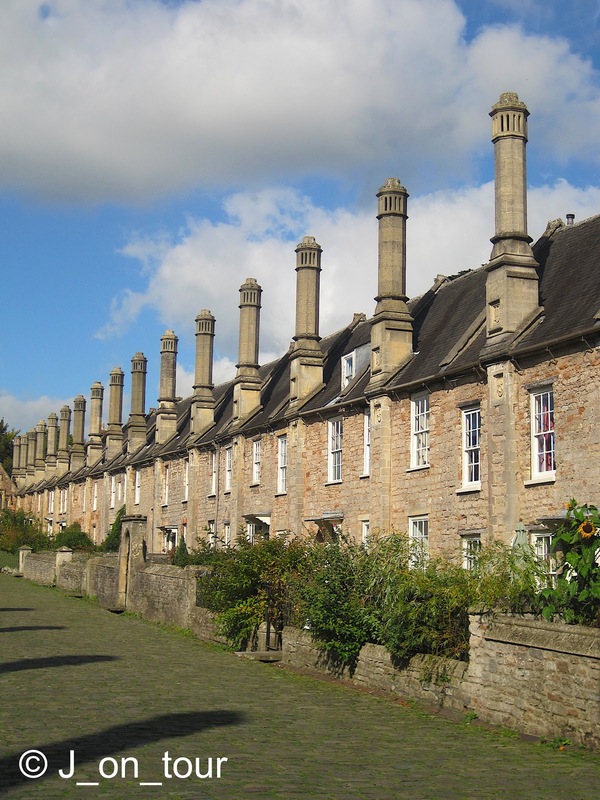 Thanks, I like the repetition feel with these chimneys, glad you liked it. Sweet Virginia Breeze... Thanks, The street design is a clever trick of the eye that seemed well ahead of it's time. Joo... Thanks, I would have spent more time on these images if I only I had known that there were going to be people looking at these from around the world. Berit... Thanks for your great comment. JoLynne Lyon... Thanks, I don't know what it is about doorways but I have loved taking these and thought that there was something wrong with me until I started following certain people on blogger, then I discovered that I was not alone. Vikki Lane... Thanks, that would be a great picture of the priests !! Denise... Thanks, I don't consider myself a brilliant photographer, I just see certain things differently and hope my style is natural and accessible. You may not have the architecture but there are always some tips that you can pick up from others. There are some incredible photographers streets ahead of me listed in this comments section. Phivos Nicolaides... Thanks, no need to be jealous, I'm just an ordinary guy that travels and so happens to have a camera to record my journey hopefully in an informative and entertaining style. Adrian... Thanks, I have never deleted any comments yet, not even the comment that someone wrote on post number 1. I linked you to my e-mail but didn't get a reply about which program to go for. Trevor Woodford... Thanks, I agree although as I said in earlier comments, there was never enough time to spend here with the camera as it was always a partial shopping day !! DUTA... Thanks, The names do sound a bit unusual now that you mention it. Other cities might call entrances and gates by more formal names. Cimpoaca Laurentiu... Thanks, I thought people would like the first image. Wind... Thanks, Hopefully the weather will be getting better for you. Your lamp shot was outstanding, I probably could have done more with mine. At the time it was a bit of an experiment. Mahon... Thanks, It's always good to see you here just as it is for me to look at your blog. 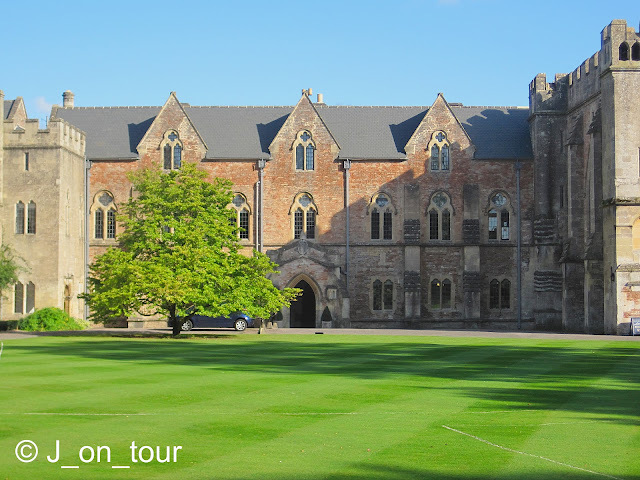 I wonder if you can contact me about possibly using one of your images for a publicity leaflet for the Bishop's Palace, Wells. The Gatehouse image is fantastic and if possible we would like to reproduce this as a small image on the upcoming events leaflet. Obviously we are seeking you permission to do so and we would credit you accordingly. If you require a royalty payment please let me know what you might charge. It may or may not effect its use! Time is short - they want to go to print tomorrow. Typically!